As a prelude to a proposed invasion of the Japanese mainland, scheduled for November 1, U.S. forces bombed the Japanese home islands from sea and air, as well as blowing Japanese warships out of the water. The end was near for Imperial Japan, but it was determined to go down fighting. 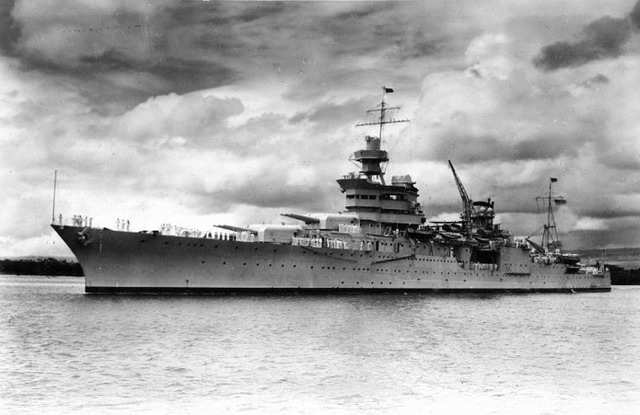 Just before midnight of the 29th, the Indianapolis, an American cruiser that was the flagship of the Fifth Fleet, was on its way, unescorted, to Guam, then Okinawa. It never made it. It was torpedoed by a Japanese submarine. Interestingly, the sub was commanded by a lieutenant who had also participated in the Pearl Harbor invasion. There were 1,196 crewmen onboard the Indianapolis; over 350 died upon impact of the torpedo or went down with the ship. More than 800 fell into the Pacific. Of those, approximately 50 died that first night in the water from injuries suffered in the torpedo explosion; the remaining seamen were left to flounder in the Pacific, fend off sharks, drink sea water (which drove some insane), and wait to be rescued. Because there was no time for a distress signal before the Indianapolis went down, it was 84 hours before help arrived. This was despite the fact that American naval headquarters had intercepted a message on July 30 from the Japanese sub commander responsible for sinking the Indianapolis, describing the type of ship sunk and its location. (The Americans assumed it was an exaggerated boast and didn’t bother to follow up.) Only 318 survived; the rest were eaten by sharks or drowned. The Indianapolis’s commander, Captain Charles McVay, was the only officer ever to be court-martialed for the loss of a ship during wartime in the history of the U.S. Navy. Had the attack happened only three days earlier, the Indianapolis would have been sunk carrying special cargo-the atom bomb, which it delivered to Tinian Island, northeast of Guam, for scientists to assemble.